Solid Titanium case and strap is great. My watch weighs so much less because it’s Titanium. It’s also so much tougher than stainless steel and hypoallergenic too. Shame it needs batteries and isn’t solar powered. I have been using Suunto Traverse for long time. 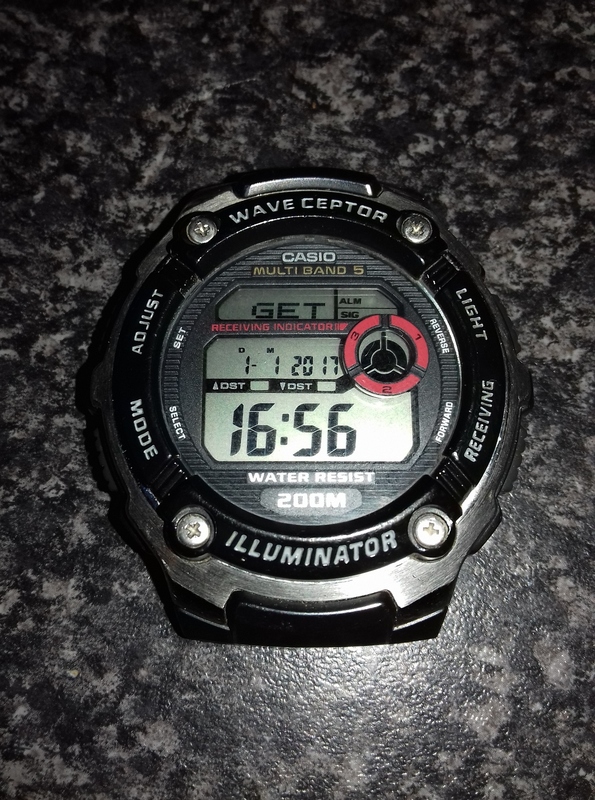 I have the Casio Wavecepter as shown in the thread above. Reading up about the watch on the Internet led me to discover that a common fault is constant resetting. 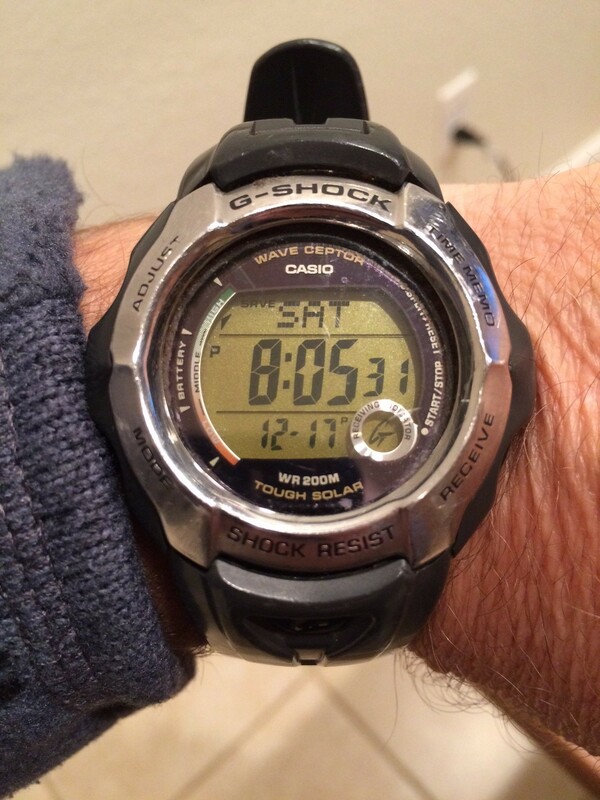 I’ve had the reset problem but now the watch has stopped receiving time updates over RF. I can still set the time manually but I can’t trust the watch not to reset. The reset issue wasn’t such a headache when the watch could auto update with correct time. I got a clock from Mike 2E0YYY and it’s got lovely big easy-to-see numbers on it. 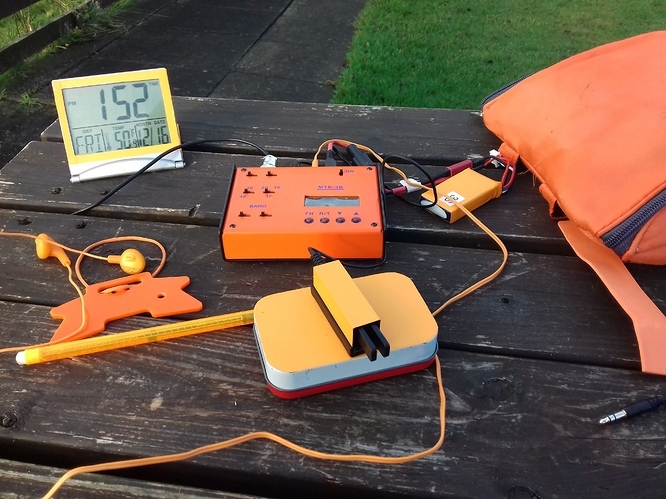 The clock now lives in my MTR pack. I have an old Timex RC Watch but the strap is really scruffy. 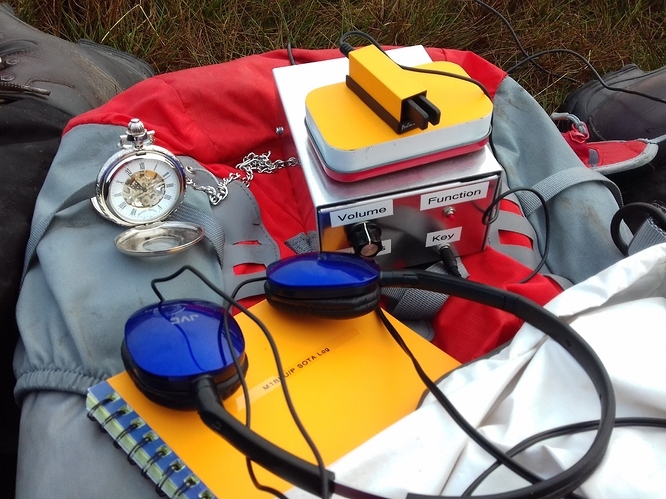 I put the Timex watch on this morning in readiness for my Ingleborough G/NP-005 activation today and about 30 minutes later the strap broke Luckily I had another timepiece with me today. No, Ed, I won’t retract it. 30m is the band where gentleman are to found, as are 160m and 17m. 160m may be ‘The’ gentleman’s band but 30m is ‘a’ gentleman’s band! 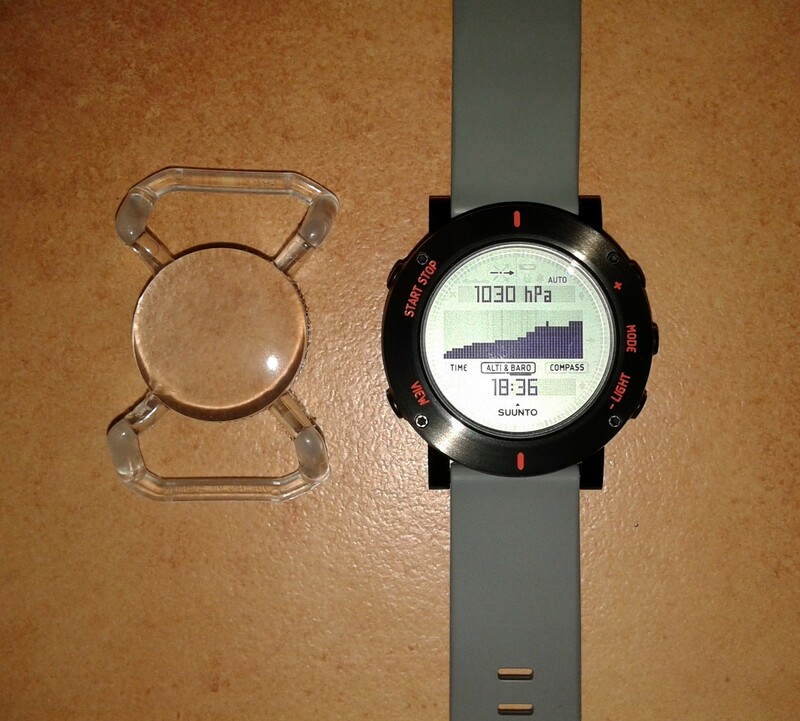 I always use my mountain Suunto. 160m may be ‘The’ gentleman’s band but 30m is ‘a’ gentleman’s band! 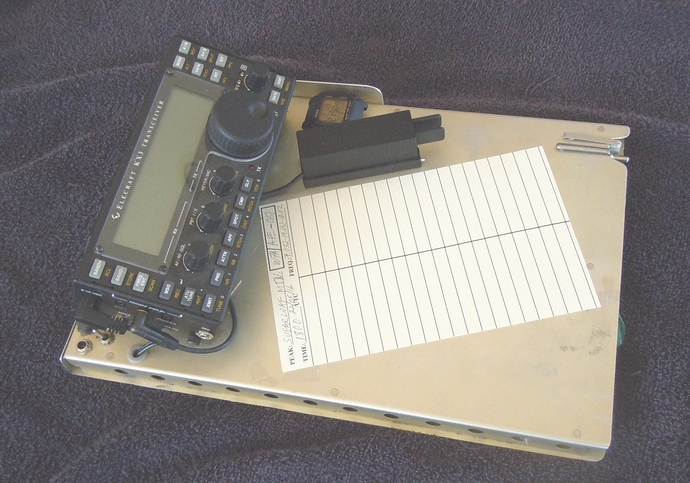 No problem with that Colin - 30m, one of the Gentleman’s Bands. I actually agree with you - when I used it in Australia - I found a real camaraderie on the band! Now I “just” need to learn Morse (or digital) to get back on it here in Region 1. Maybe a wind up power source for the QRP radio would go nicely? Love the dayglo colours. Easy to see against the snow, grass, dirt, rocks, anything! Even the lock has a dayglo surround, presumably added by you! Fabulous! My trusty, beat-up, old Casio “G-Shock.” I love it because it is set nightly by a signal from the atomic clock in Colorado, plus the battery is rechargeable–the black around the edges is made of small solar panels. I have not had to set it or worry about the battery for years. 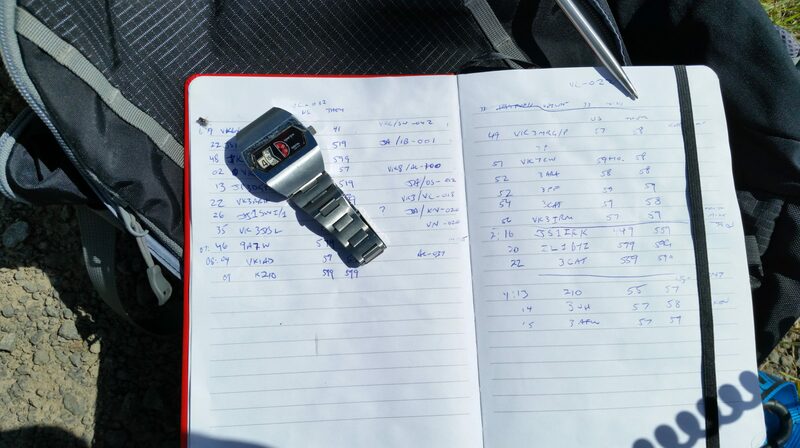 It’s set for local time, so I have to do some quick math when logging SOTA contacts. It’s also handy at work (I’m a passenger train conductor) because the time is always exact. 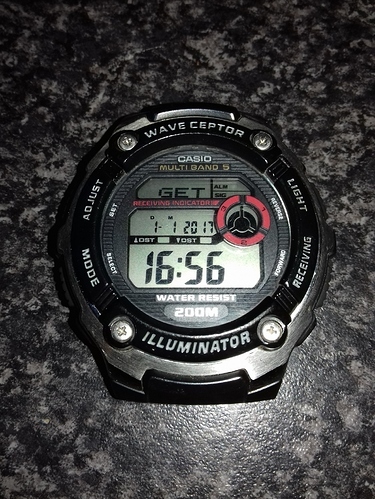 My Casio G-Shock watch has to be facing in a certain direction (easterly in my case) to receive the signal. I don’t know if that would be a factor in your case, though. Using a CASIO watch, with band removed, fixed with a Velcro pair to the desk. outside aluminum protector keeps buttons on watch from being pushed by accident. 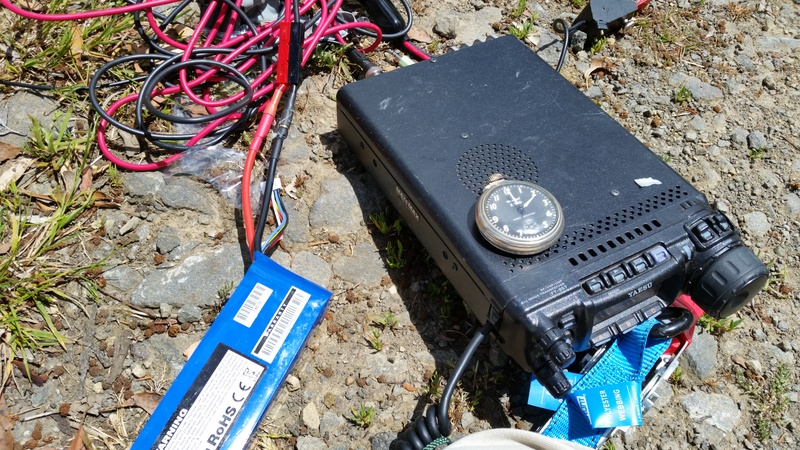 6 AH batt and pens inside; log taped to top; everything but the antenna, in one piece. I’ve always been the curious type and I really had to take my old watch apart yesterday! After a few minutes, I found a broken wire. I managed to get in with a tiny soldering iron and reconnect the wire from the antenna - success! My old R/C watch lives again! The antenna is beneath the rectangular patch, the enamelled wire (brownish) can be seen. 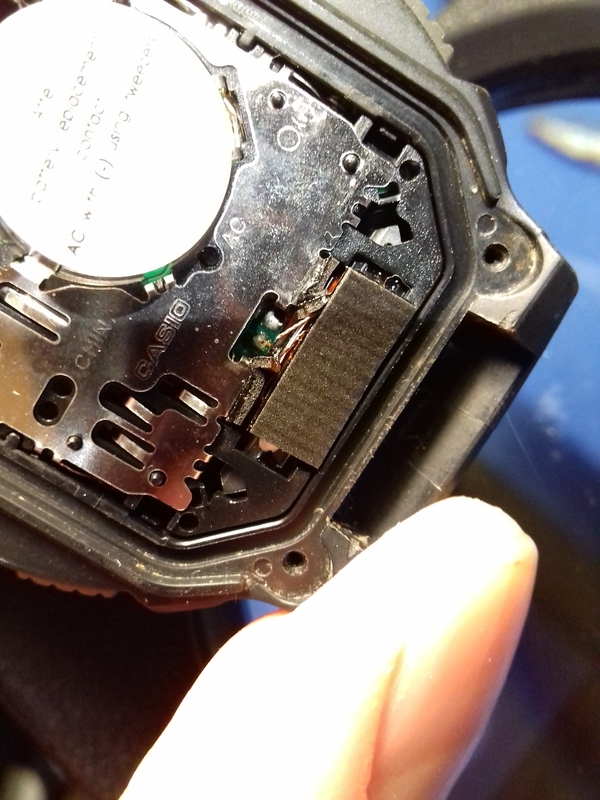 It’s difficult to see but the wire should be connected to that blob of solder. 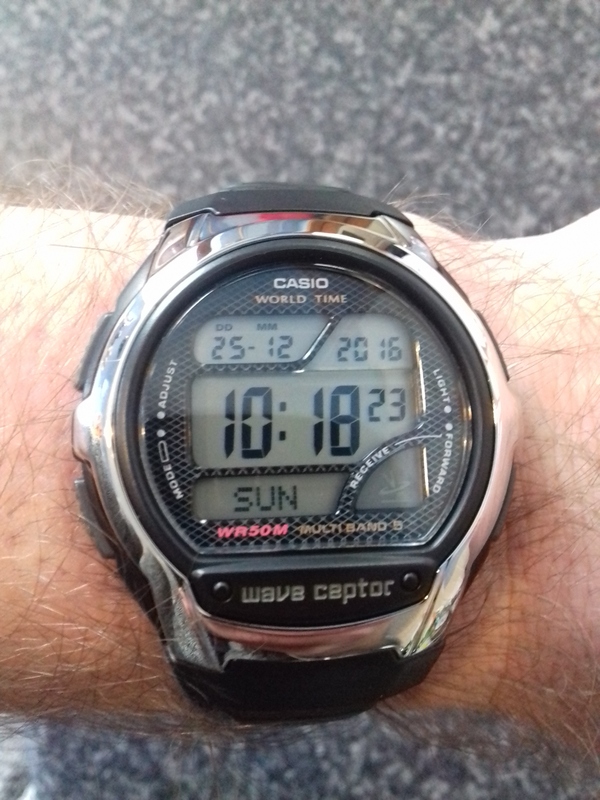 My original Casio Wavecepter (in post above) is still performing beautifully, however, unfortunately the strap has become very brittle and has a crack across half of it’s width. Mr Amazon has promised to bring me a brand new OEM strap tomorrow. At £8.41 delivered, I think the investment is well worth it to ensure my SOTA companion can live on. 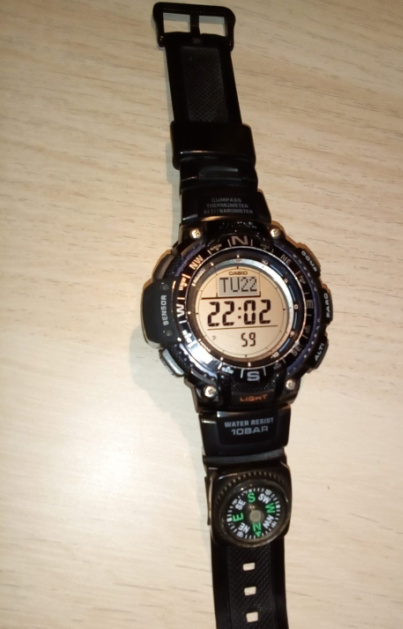 My cheapo Chinese digital watch with BT link to my smart phone to display SOTA spots plus it’s own built-in telephone and SMS on it’s own SIM card continues to work as well however I have to admit, I hardly ever use it. It was an inrteresting technology purchase but not a lot more than that.
. . . same here … but using my regular clock on the wrist in case the tablet should fail. Oh, wow! A Radio offfice’s/officer’s wrist watch. Where can I get one PSE? This is going to be the post #100 so I’m not sure whether it will actually be posted or the system will close the thread because it’s reached 100 posts. We’ll see. In any case, I’ll create a part 2 thread because it’s been fun and I think we might wish to continue discussing about these always lovely time machines. My SOTA wristwatch keeps working fine although it’s starting to give some signs of needing a battery change. I wear it everyday, not only for SOTA activating and the strap isn’t yet showing any crack, although I know at sometime it will. In spite of this watch having a digital built-in compass, I have included a small and nice analogic one fitted into the strap. I like it and I use it always while setting up my endfed for SOTA. 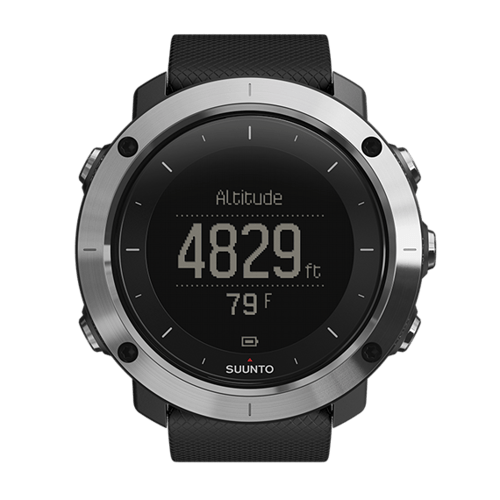 I find easier and faster looking at this external compass rather than pressing the top right button and finding the small indicator on the watch screen. Where did I get this compass from? Well, it was included in one of my daughter’s Barbie doll kit or something like that (I don’t remember exactly) and I found it lost in some box in our house during one of the always necessary cleanning operations we, parents, have to do as the kids grow up and leave some toys abandoned.